I will conclude our vacation blog with some sights from the carriage tour. 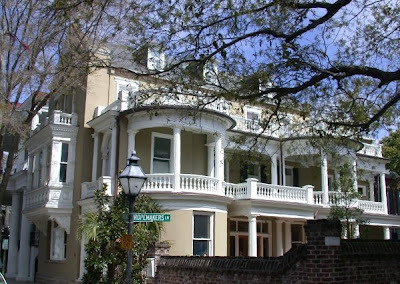 One of the many unique aspects of the historic Charleston houses are the wonderful two story porches, the piazzas. 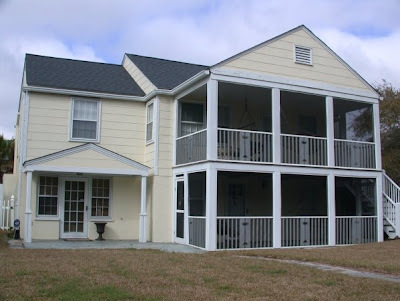 These porches were designed to collect the southern summer breezes and provide some relief from the humid summers in the Charleston area. It is interesting that there is always a house door which is locked that leads onto the piazza. 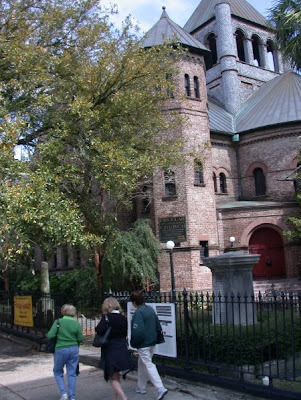 There are so many wonderful historic churches in this area. 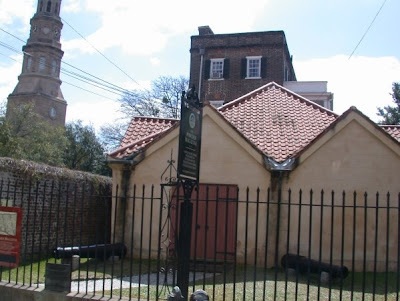 The Powder Magazine below is a gunpowder magazine in Charleston and the oldest surviving public building in the Carolinas. It was erected in 1713 by colonial settlers as a place to safely store and centralize their gunpowder supplies. 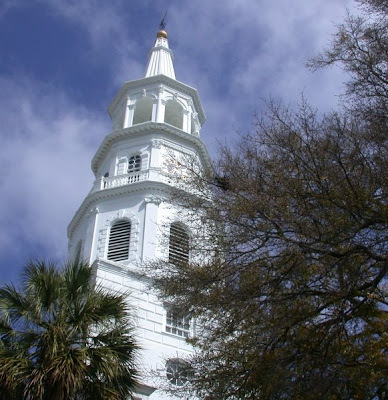 It was also involved in the 1780 siege of Charleston. 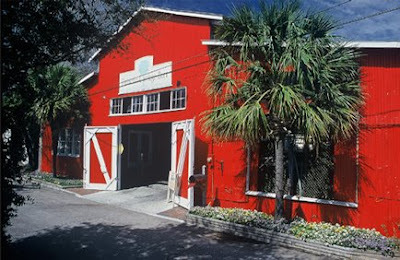 The Powder Magazine was declared a National Historic Landmark in 1989. It has operated as a museum since the early 1900s, although extensive renovations have since been conducted. 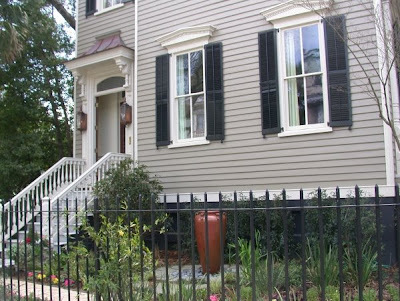 Here is another interesting fact of the historic Charleston houses - the shutter paint. I know the shutters on the house above seems as if they are painted black. Thy be wrong! 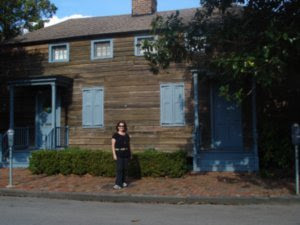 The shutters, painted in what looks like black, is actually "Charleston green" - a color rooted in the black paint given to Charleston by the federal government after the Civil War. The paint that the citizens, the story goes, could not bear to use as it was, for not only was did it resonate with mourning, it was from the Yankees, so they tinted it with a bit of yellow to make Charleston Green. You can buy "Charleston Green" by the gallon in stores like Lowes and WalMart. You know you have arrived when you can buy a spray can of Rustoleum in this color! As we get closer to the center of the historic area, the crafters start appearing. 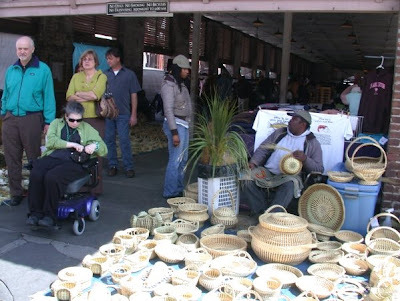 Especially the folks who make those great sweetgrass baskets. If you think that you will bring home a medium sized sweetgrass basket for under $100, you are dreaming! 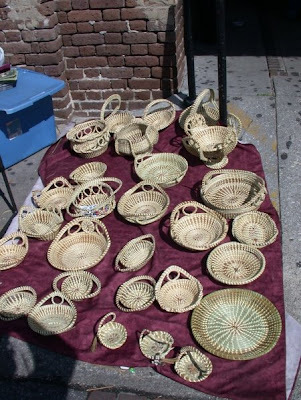 Even small baskets sell for several hundreds of dollars. Basketmakers are faced with changes and challenges that threaten the existence of their craft. The supply of sweetgrass is becoming more difficult to acquire because the natural habitats of sweetgrass have significantly diminished. Two primary factors have led to this situation. First, the urbanization of the area around Mt. 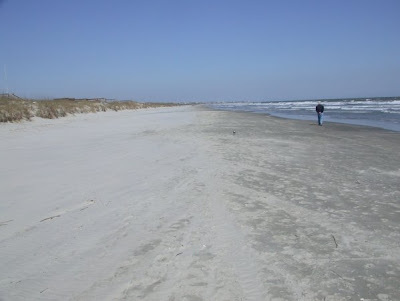 Pleasant/Isle of Palms has led to the destruction of much of the natural sweetgrass plant communities. 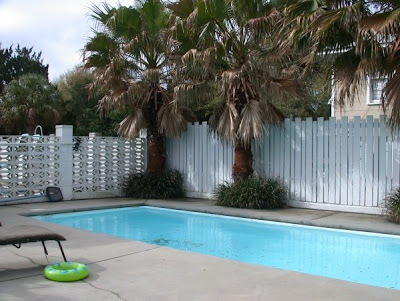 Second, the traditional gathering areas on the Barrier Islands off the coast of Charleston, have been developed as beach resorts or private communities with restricted access. 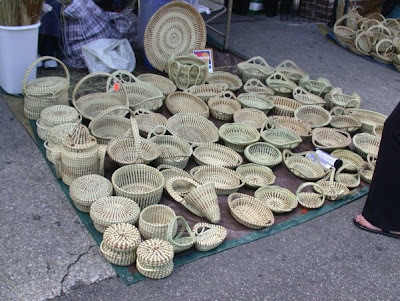 Basketmakers now have to travel to Georgia and Florida to find adequate supplies. After the carriage ride, we ate a late lunch on the roof of a local eatery. We shared our gourmet experience with this cool dude! It was another great time in historic Charleston! 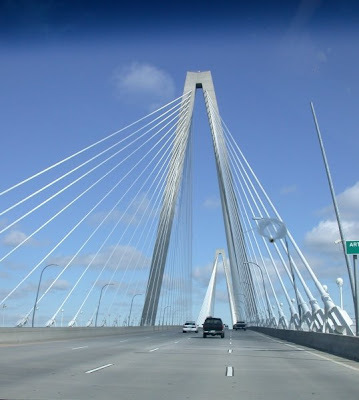 We crossed the Arthur Ravenel Bridge which is a cable-stayed bridge over the Cooper River connecting downtown Charleston to Mount Pleasant/Isle of Palms. The eight lane bridge opened in 2005 to replace two obsolete cantilever truss bridges. The bridge has a main span of 1,546 feet (471 m), the longest among cable-stayed bridges in the Western Hemisphere. Sorry for the smear on the Sarah's windshield. Tis an infamous avain dropping. Could not stop and clean the windshield. The family was off to participate in another Charleston, SC, carriage tour. 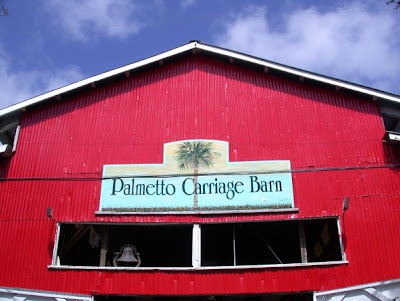 We have always used the Palmetto Carriage Company for our tours. They do a great job. 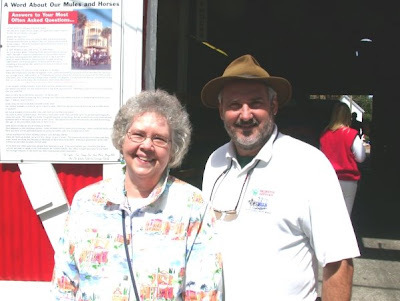 Judy had to check out our departure area which is the Red Barn. 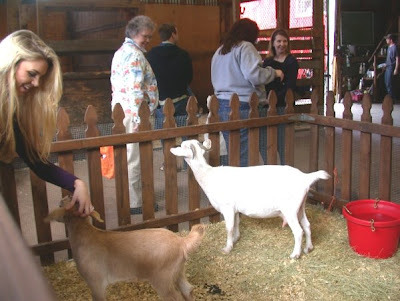 A gal has to love baby goats! 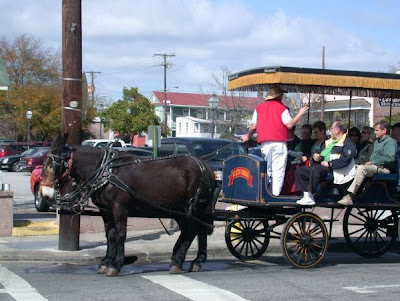 The Palmetto tours use only mules as the power for their carraiges. 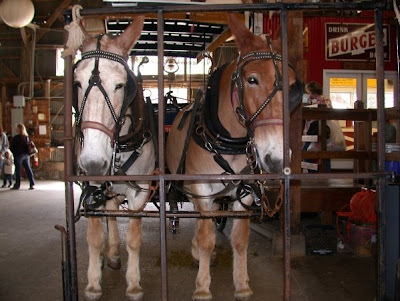 The folks have found mules to be the best animals for pulling carriages in Charleston. 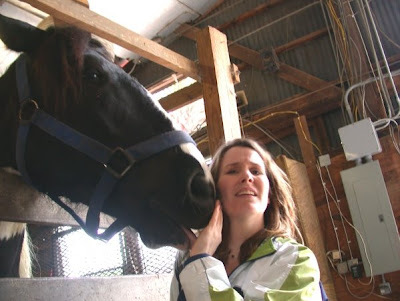 In over 25 years of use, their health record is much more successful than that of the draft horses. Alicia is a horse lady. 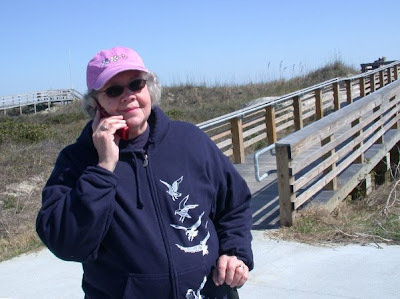 Forgot to mention that Alicia joined us on the Isle of Palms. She is a special lady. Our mules are ready to go! Judy posed with our guide. This gentlemen did a fantastic job! 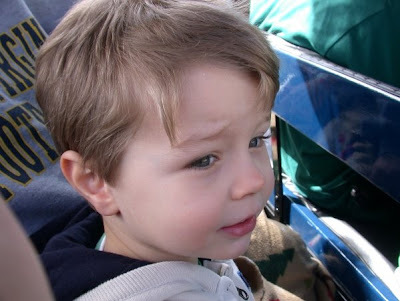 Sammy boarded the carriage and we were all now ready to start our look around historic Charleston. The folks rented a house that was constructed in the 1940's. The cottage had been newly renovated. I did not take a photo of our downstairs bedroom. It was painted in the spirit of the south. The color was "haint" blue. 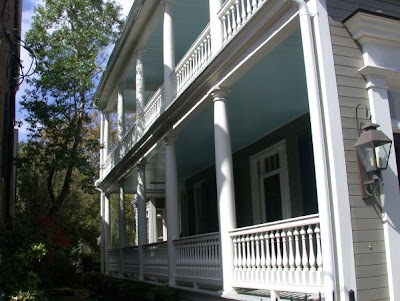 Haint blue is derived from the word haint which is a spirit or a ghost, and in Charleston, many people also paint the trim on their houses blue to ward off evil spirits. 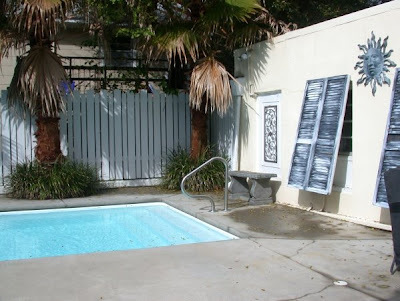 The following house exhibits the ability of shedding haunted spirits by painting entry points haint blue. Well, I did not have evil dreams while sleeping in our haint blue bedroom. (This is not a scientific statement since I never have evil dreams!) Sammy loved the house. 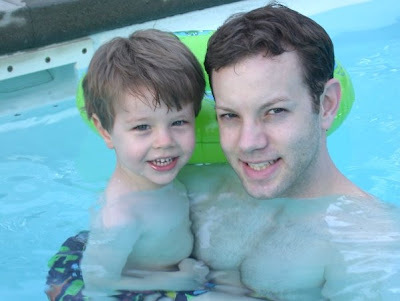 His favorite was, of course, the pool. 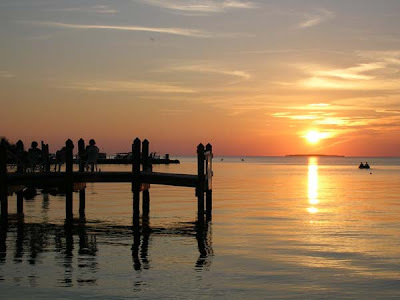 The island's original inhabitants were the Seewee Native American tribe. Supposedly, they greeted the first English to arrive on the island by swimming out to their ships and escorting them back to the island. 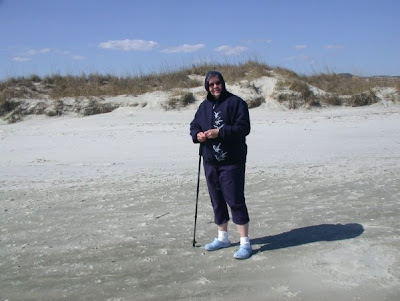 During our week on the Isle of Palms, the temperatures were in the 60's and the wind was vigorous. 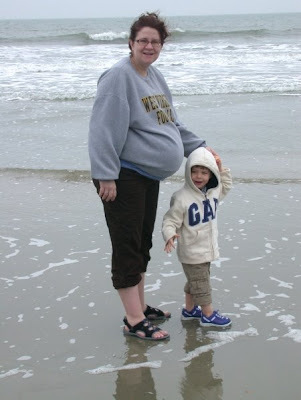 We were cold when we visited the beach. I hope the Seewee greeted the English during a hot humid day in August! 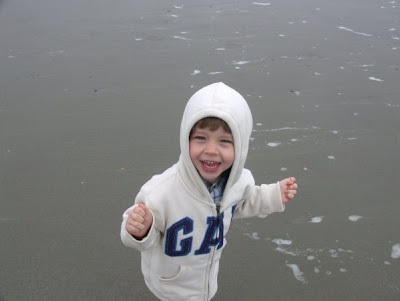 The waves are always a joy to kids. Sammy is no exception. Here is Sammy with his developing new brother. 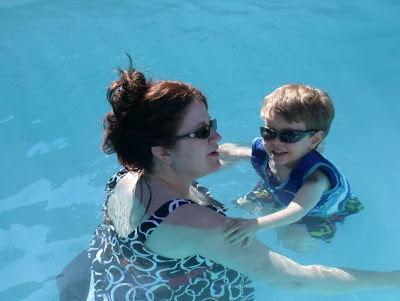 Yes, we have been on vacation for the past week and the blog has suffered. 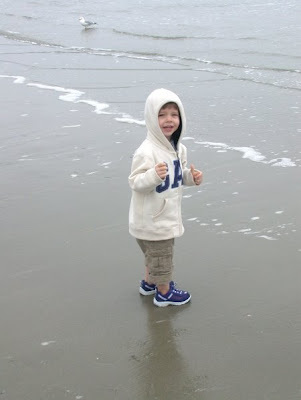 We shared some family time with Sarah, Jeff, and Sammy on the Isle of Palms. 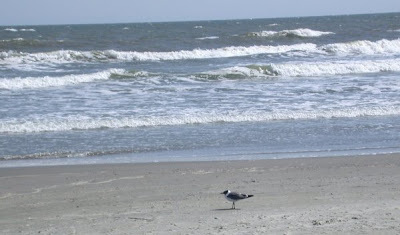 The Isle of Palms is a barrier island directly across the harbor from Charleston, SC. I promise to update the blog in the next few days. Thanks to Bob Weaver of the Hur Herald for the following article. 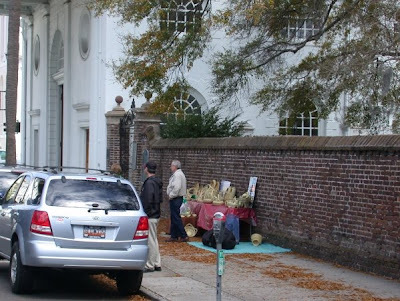 Originally published in the Charleston Daily Mail, this event was an interesting twist to the typical funeral. 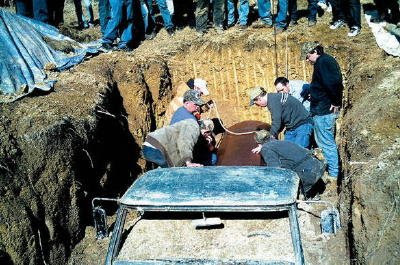 CLAY COUNTY, W.Va. - In a burial plot that is 19 feet long and nine feet wide, Albert Dancy Jr. lies in a casket in a vault in his 1967 Chevy pickup. Wearing Realtree camouflage, Dancy, 50, went on to the next life accompanied by a couple of other favorite things: his Old Timer pocketknife and Remington .243-caliber deer rifle. Dancy said he wanted to be buried with his jaguar green truck, which he'd owned for as long as his 24-year-old son Adam can remember. "He said it always joking around, but he said it for so many years it was pretty much serious to me," said Adam, who lives in Dille in Clay County. "I always took him seriously. It was the last thing I could do for him." A native of Sutton, Albert enjoyed hunting, fishing, working on trucks and riding four-wheelers. He was a carpenter, a miner for Massey Coal, and a member of the American Hunting Association and Friends of Coal. 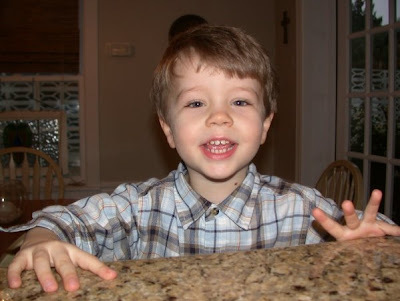 On Feb. 15, just a week after his birthday, Albert was shot and killed. State Police Sgt. R.D. Lilly said it started out as a domestic dispute between Dancy's ex-wife and Robert Dodrill Jr., 44, of Summersville. Dodrill is accused of forcing his way into the Albert's mobile home at the Pine Trailer Park in Summersville and shooting him in the chest with a small caliber handgun, Lilly said. Dodrill is in the Central Regional Jail on charges of first-degree murder and burglary. Albert is survived by his two sons, four brothers, three sisters, a half-brother and three grandchildren. Adam said the family concurred on what needed to be done to give his dad the kind of burial he would have wanted. "I mentioned it one time and we all made it happen," Adam said. The pocketknife was something that his dad always carried, and the rifle had sentimental value. "It wasn't really his favorite gun but the year before last he killed a nice 10-point buck with it and got it mounted, so I figured I'd put it in there with him," Adam said. Adam decided to bury his father on his own place in Clay County, the place where he was raised and took over for himself after his parents divorced. "I started a family cemetery because most cemeteries don't let you bury a pick-up truck," Adam said. His uncle brought over a backhoe. For two days they dug the burial plot. It took another day to disassemble the truck. "I explained to them what they needed to take off the vehicle," said Steve Jeffers, owner of the Greene-Robertson Funeral Home in Sutton. The Chevy was stripped of anything that could harm the environment: the motor, transmission, brake fluid and tires. The truck was put in the ground. The vault with the casket was then lowered into the bed of the pickup. And it was all covered with dirt. 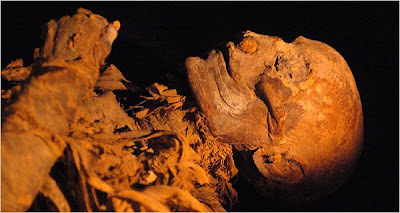 Adam Dancy said he didn't mean for it to be an Egyptian burial ritual or anything. If he had, the truck and gun aren't going to be much use. "We gave him a truck with no tires. We gave him a gun with no shells," Dancy said. "He'll be s-t out of luck." Now This Is The Way! We often have trouble deciding on a name for our newborns. Think this may be the start of an Appalachian tradition if we used something else beside melons. Any suggestions? 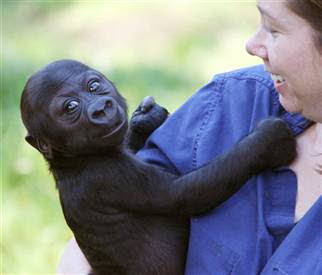 SAN FRANCISCO - The father of a 3-month-old western lowland gorilla abandoned by its mother at the San Francisco Zoo has picked a handsome name for his son. Zookeepers on Wednesday (set up five different melons in the father gorilla's enclosure, each one representing a different name. Yep, floating around our blue planet is a plethora of man-made pollution. As you recall, we had breaking news yesterday regarding the evacuation of the international space station. The international space station's three crew members climbed into their Soyuz lifeboat as a "precautionary measure" while a piece of space junk passed by today, NASA said. The space agency said the debris from a spent satellite rocket motor zipped past, apparently without causing damage, and the crew was given the all-clear to return to the station and resume normal operations. Space agency spokesmen said yesterday afternoon that the debris was about 5 inches (12.7 centimeters) in size, which would be larger than the initial estimates of 0.35 inches (9 millimeters). 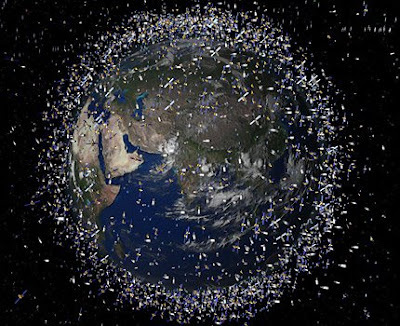 The space junk, said to be from a PAM-D, or payload assist motor, was projected to pass about 4.5 kilometers (2.8 miles) from the station at 12:39 p.m. ET, Jeffs said. My question is why do we know that a 5 inch piece of metal is approaching the space station when we did not know or were not told of the 2 mile long asteroid that brushed close by the earth? If you remember the ole science fiction movie, Asteroid, you will recall that we humans had plenty of time to prepare for our approaching doom. 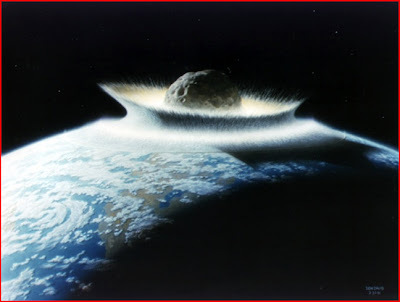 Technology finally saved the day when the asteroid was destroyed. Guess it may be not really important to know if we are going to hammered by an asteroid with the force of 1000 Hiroshima type bombs! Today is the sister's birthday. Happy 58th, Miss Judy! OK, the reason I say that is the strange tale of a pet shop owner in Philadelphia. This arrived from the Associated Press yesterday. 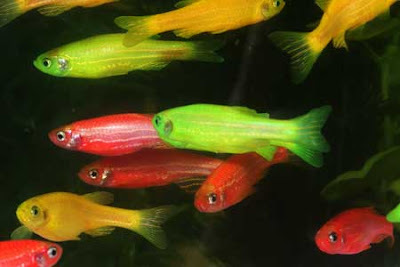 Employees of a Philadelphia pet store expecting to get a shipment of tropical fish and salt water by air cargo ended up getting a human body instead. Mark Arabia owns the Pets Plus store in Northeast Philadelphia where the mix-up was discovered Tuesday. He said he eventually learned that the body he got was that of a 65-year-old San Diego-area man who died of early onset Alzheimer's disease. The body was supposed to go to a laboratory in Allentown so samples could be taken for medical research. US Airways released a statement saying the problem was caused by a "verbal miscommunication between a delivery driver and the cargo representative." 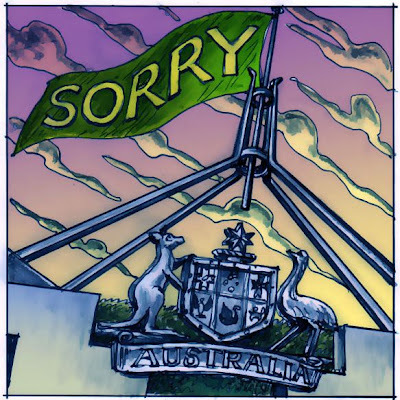 The airline said it's deeply sorry. Arabia said he believes the fish died as a result. Boy, I bet US Airways is really sorry! The company was DEAD wrong in both of the shipments. 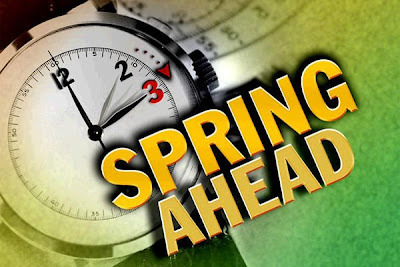 I am certain that you all are now in the groove and have changed the time from EST to EDST. 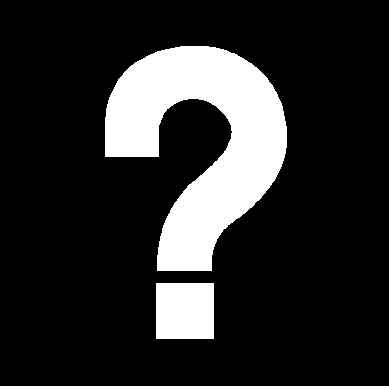 You are probably wondering about the initials EDRT. I actually believe that Daylight Savings Time is a dumb way of saying what happened today. I would rather call this event Eastern Daylight Reapportioned Time. I mean - what daylight are we saving and where in the devil are we saving it? Grandma Great Meads is wonderful. We called and explained the process of changing the clocks forward one hour and leave the minutes alone. She does well for an 84 year young person. She did call last night around 8:30 P.M. and wanted to know - "What time is it now?" 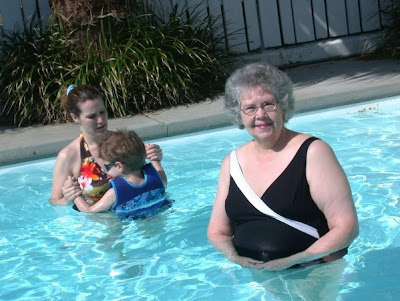 We told her not to worry that the change will be in effect when she gets up in the morning. What a great weekend! Twas sunny and in the 70's. The old biology guy's blood starts to flow faster when the sounds of spring surround him. 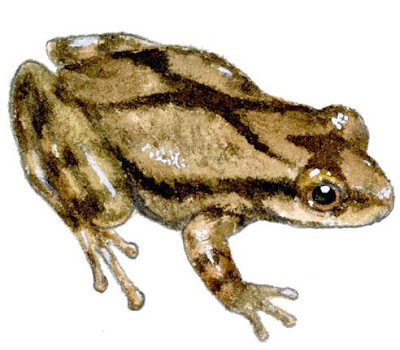 The little tree frog above, spring peeper (Pseudacris crucifer) is calling. I am certain that amplexus can not be far behind. 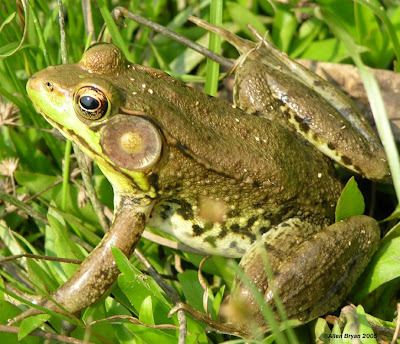 I even observed a small green frog (Rana clamitans) jump into the backyard pond. I am certain that there are more days like these in store for us. HURRAY! 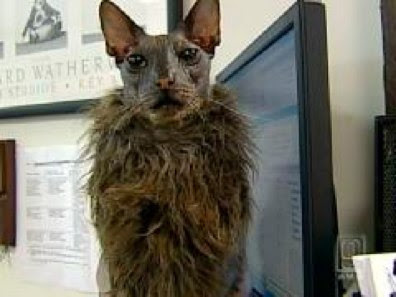 Several days ago the television news folks did a spot on the ugliest cat. His name is Bat Boy. 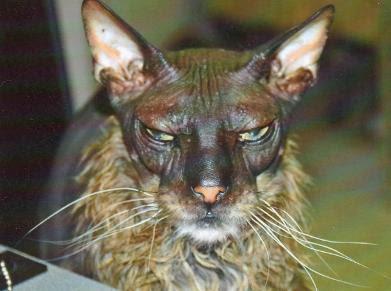 He is an 8-year-old cat named Ugly Bat Boy -- Uggs for short -- a loveable, genetic mystery that would fit quite nicely into the Star Wars bar scene. "He's my cat. I like him!" insists veterinarian Stephen Bassett of the Exeter Animal Hospital in Stratham. NH. "He's escaped before and kind of frightened some neighbors," the vet confesses. "Because he was running through the yard and they didn't know what he was." 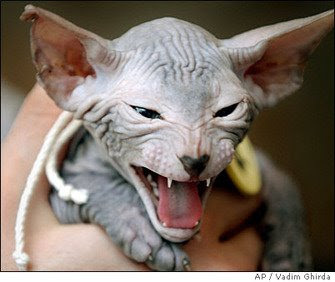 Believe it or not, Ugly Bat Boy had a sister that looked just like him, but she died as a kitten, despite Bassett's extraordinary efforts to save her. 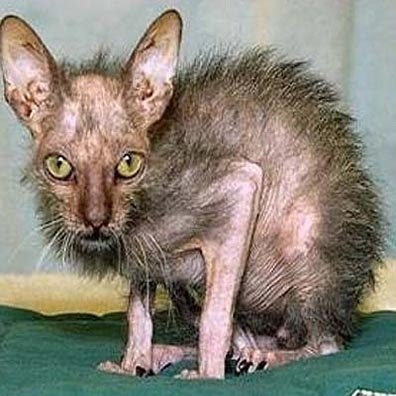 Let me tell you, my friends, that there are ugly cats and then there are really ugly cats. The cats below are beauty pagent winners in comparision to a cat we knew. His name was Dexter. He came out to gret us as we would go visit friends. Dexter was an outside cat, and very friendly. That was a problem. When we would arrive at our destination, here would come Dexter, wabbling out of the woods. I always have thought that Dexter really lived in an ancient cemetary somewhere over the bank. Dexter could easily have been a character from a Stephen King novel. Judy and I think that Dexter was at least 120 years old. He had warts all over the hairless body and we were certain that parasites have ravaged his system for many years. He was so skinny that I could have presented a lecture on skeletonal anatomy of this creature. You could see definite bone structures. As he slowly approached, Dexter would look up at you with these eyes that actually were so clouded with cataracts that he looked possessed. To make matters worse, there was only one tooth in his head - a fang that jutted out at a 45 degree angle from his left jaw. Man, could ole Dexter drool! Dexter brought drooling to a fine art with copious volumes of saliva trailing behind him. He would rub against our legs marking us with this trailing liquid. I am certain that Dexter's owners did what they could, but the ravages of old age has taken over this creature. I never took a photograph of Dexter - I believed that Dexter should not be remembered at this stage of his life. I am certain that he was a cute gray, short-haired kitten in the early years!